This is the main forum thread for discussing Fusion's Chao Editor, a program I made for editing chao on the PC versions of SADX and SA2B. You can check there for the full overview, features, screenshots, downloads, updates, and the version history. However, for your convenience, I'll also include some basic information in this thread. Those of you who play SADX PC have probably tried GerbilSoft's SADX PC Memory Editor v2.00 BETA at some point. It works, and provides you with some useful editing abilities. However, it also has a lot of problems. It's built on legacy technology (Visual Basic 6), and as a result it can be very difficult to even get running; for example, you are forced to download a library file and register it through the command line, and aren't given any instructions to do this. It also has few features and a very basic interface. 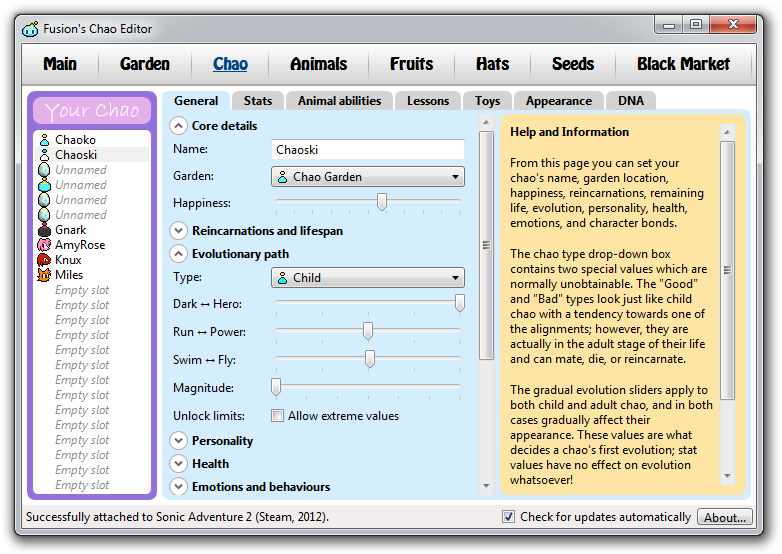 In order to edit your chao, you must select its slot number from a drop-down box, remember to click "Read Chao", change the values, and then remember to click "Write Chao". It is a long and tedious process. My editor was originally developed to correct the above problems. It has since been extended with a large number of additional features, including support for the Steam releases of SADX and SA2B. It has been developed using the latest modern technology, and runs on the Microsoft .NET Framework 4.0 Client Profile. You may already have this useful framework installed, but if not, the setup file will take care of it for you. When you run the program, you should find that it has a very user-friendly interface and is easy to work with. 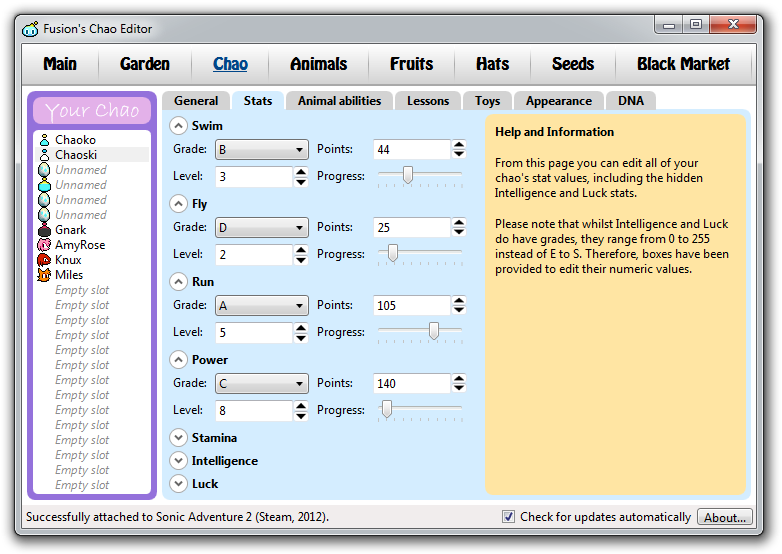 It will read and write changes to your chao data instantly, and provides you with a significant level of control. For a full list of features, check out the features page on my website. I'll give you a basic summary here, though. Happiness (the other editor claims to do this, but it's incorrect). Emotions and actions, such as crying, sleeping, or jumping with joy. Bonds with the different characters. Collected animals that are in the gardens. Fruits that are in the gardens. Hats that are in the gardens. Seeds that are in the gardens. The items for sale in the Black Market. 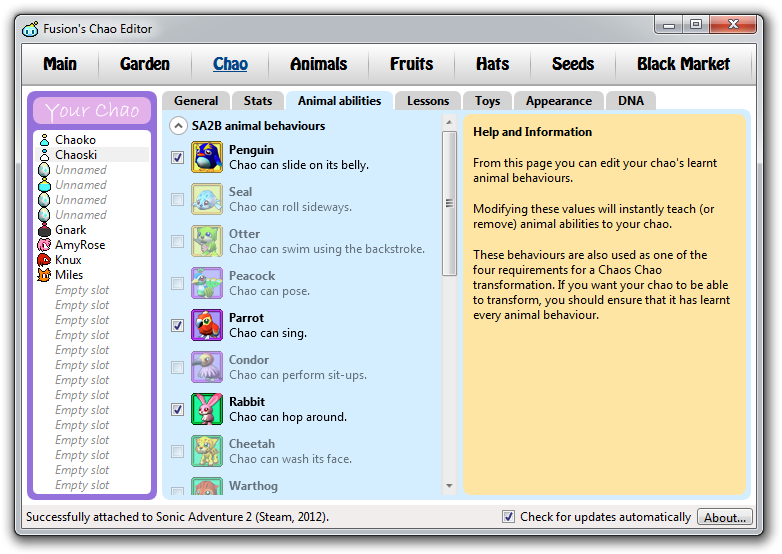 Finally, you can also right-click on any of your chao in the editor to get a special menu. 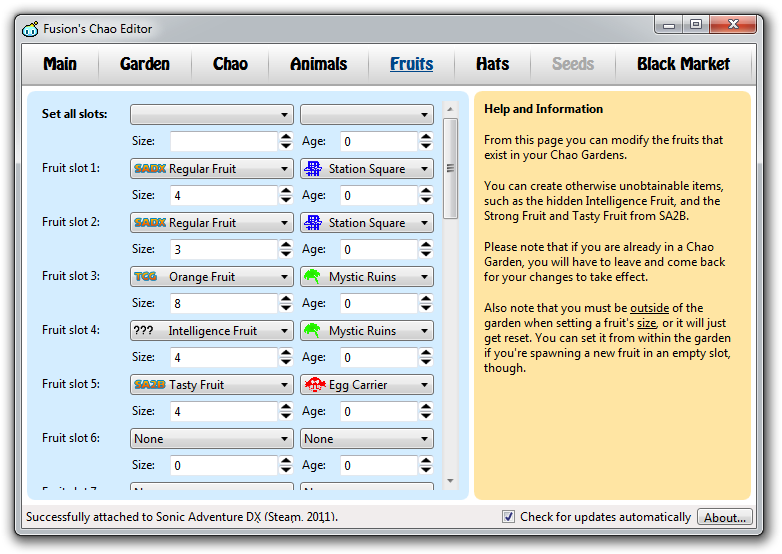 This menu will let you cut, copy, and paste your chao between slots, delete your chao, or create a new egg in the slot. It will also let you export your chao to a .chao file, which can serve as a permanent backup or allow you to share it with your friends! 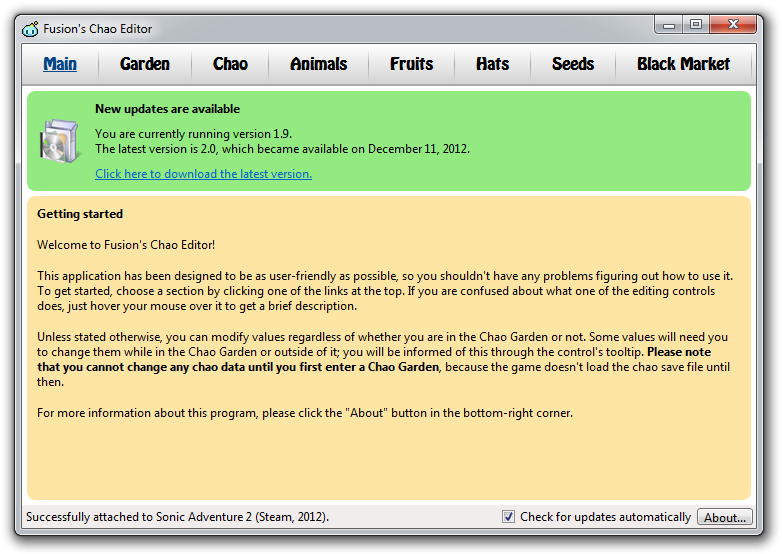 You can also import chao from .chao files into any slot you wish. This way, you don't need to replace your entire garden save file to borrow somebody else's chao. These functions also allow you to transfer chao between SADX and SA2B on the PC. It's always nice to see what something looks like before you download it, so here are a few screenshots of the program. I'll put them in a spoiler tag to save space. Check out the screenshots page on my website for more. My program only really has two system requirements. Operating system: For the greatest user experience, you should be running either Windows Vista or Windows 7. However, you can still use this with Windows XP, as long as you have Service Pack 3 installed. It might not look as good, but it'll work. Interested in my program? Want to download it? Just head over to the downloads page on my website. I recommend you choose the setup exe option. Have any opinions? Have any feedback to give me? Found a bug? Just post here or contact me through any other method. It's always possible that there are some bugs; however, I have thoroughly tested it and haven't yet found any. This program will be regularly updated as bugs are reported and fixed, or as new hacking discoveries are made. Don't do large upgrades to a chao's stats when you are in the garden it is in. It will make the game lag and crash. Atleast it did for me. EDIT: Well, you just shouldn't hold it. Last edited by Maple on Sat Jan 15, 2011 2:15 am, edited 1 time in total. "stop talking about your dried up fruits." Are you talking about my editor, maplestoryxsonic, or is that your experience in general with other editors and/or hacking the game yourself? I haven't noticed any problems like that. Motto: I can't believe I ate the whole thing. Hah, that's pretty cool Fusion, I wish I had SA:DX for PC. Picka and Fox's Partner, Retro's Legend. Fox Boy wrote: fusion+pie=fusion pie! Fusion wrote: Are you talking about my editor, maplestoryxsonic, or is that your experience in general with other editors and/or hacking the game yourself? I haven't noticed any problems like that. I was talking about your specific editor. But I realized it was just because I edited a chao while I was holding it, and I made it from the lowest stats to the highest, and it made it crash. Okay. It was difficult, but I was able to reproduce the issue. It seems to happen if you increase the chao's stat level by a fair amount and also increase the chao's stat points by a significant amount, all while the chao's stat window is open. For me, increasing the level from 1 to 30 and the points from 0 to 1000 while holding the chao caused the crash. Using lower values or only changing one setting at a time did not. It's not really a problem with my editor; it's just the way the game responds to having those values changed like that. When you increase the level of a stat while the stats window is open, it tries to display the transition by filling the bar repeatedly depending on the number of level increases. It seems to break when it encounters an unexpected points value while running that transition effect. I might add a warning about it to the next version. Aargh! If only my PC was working properly at the moment! I would totally test this out! It looks MUCH better than the other one! I do like all the new things you can do with the chao, and I love how it's more of a garden editor rather than strictly for chao. I'm glad you like the look of it. Fix your PC and try it out! Location: in the land of pizza, sandwiches, and videogames. Since I'm on a mac, I can't run it, but I did read the readme. All in all, well done! I will, of course, be installing this the moment our computer gets up and running. Thanks for pointing out the mistake in the readme file. Motto: Life wouldn't be so precious if there never was an end. Quote removed because SOMEONE had to bug like 3 mods at a time over a signature. Time to boot up good ol' SADX PC. Fusion has worked hard on this and it has also helped confirm a lot of Chao theories and also some new discoveries. I'm sure we can all be very grateful for Fusion's contribution to the Chao community in general, and this editor is further evidence of what a valuable member Fusion is to Chao Island! Excellent work! I have dragons as my servants and I have almighty powers. (00:45:53) xninjy: ur not old mooncow. old is 50 or 45. Do we need to have SADX first? Or does that come with SADX? (17:44:48) Dr._Roivas: what even are you?????? Skip entire lives? Increase aging process? Dang. I need Windows and SADX PC. And, Mel Mel, I believe you need SADX beforehand/afterhand. Including it in the download file would be pirating, I think, and pirating is illegal. Thanks for the nice comments, everybody. Mel Mel wrote: Do we need to have SADX first? Or does that come with SADX? You need to install SADX yourself. Including a copy would be illegal, as Chaos the Light Chao correctly stated. It would also significantly increase the size of the download. I found a small bug. SADX stops working after trying to buy a pumpkin or skull. Ah, I see. Thank you. If you change the items for sale while you already have the buy menu open, it'll work fine; this is how I tested those particular items. If you set any of the slots to the Pumpkin or Skull hat while the buy menu is closed, then open it and buy it, the game will crash. For the next version I'll think about whether to remove those items from the drop-down boxes, display a warning message in the help panel, or somehow detect when the buy menu is open. If I did it while buying, after I returned, everything worked fine, except the pumpkin.